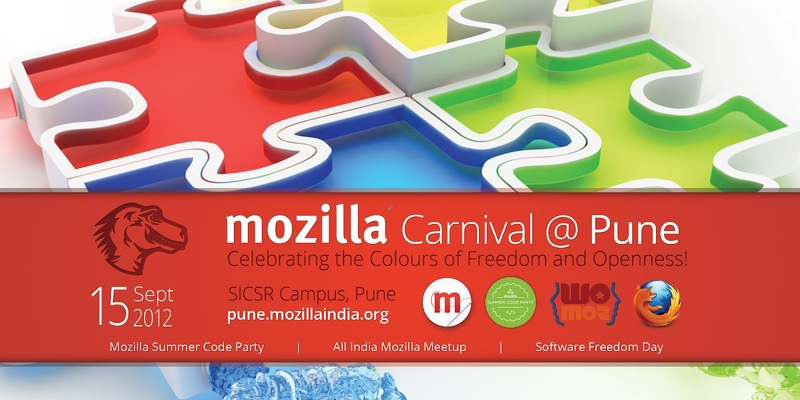 What better event does one expect than the Mozilla Carnival, for the closure of the Mozilla Summer Code Party. Right from the formation of the volunteer teams for the event to the awesome clicks at the end of the day, everything just went perfect. Soon ideas started flowing in and brainstorming resulted into a foundation of Mozilla Carnival. Soon the talks on the event venue and date were on. The discussion ended on finalizing the date to 15th September 2012 (as it being the Software Freedom Day 2012 also). The venue with no second thoughts was the most certain hub for FOSS activities in Pune, SICSR. With the Pune community organizing successful summer code party events earlier, this event had to be BIG, Au Courant and more fun. With the venue secured and date fixed, Mozilla India Reps Ankit Gadgil and Sayak Sarkar started preparations for the same. A custom logo was created for the event. The dino head symbolized the Mozilla Community and the green ribbon the host, Mozilla Pune chapter. Credits for the logo would surely go to Soumya deb and Tripad Mishra (a Mozilla Volunteer, Pune). A new banner and Posters were created by the graphics experts from the Pune Community. Custom ID cards, Stickers and Posters were printed to promote the event. All the ReMos from Pune were working hard, all the time to set the foundation of this event. IRC chats and frequent mails exchanged ideas from one to another cognizant mind. Mozilla Carnival had guests, ReMo speakers and attendees from various parts of India. "India is a country of Unity in Diversity" was rightly showcased by Mozilla Carnival. There were ReMos at the event who speak different languages like Hindi, Marathi, Telagu, Tamil, Bengali, Gujarati and Urdu. The event began with Sayak Sarkar introducing Mozilla Webmakers and Summer code party to the attendees. Then the stage was taken over by Ankit Gadgil who spoke on Introduction to FOSS, Software Freedoms, Open source and Mozilla. The complete Mozilla Story from its evolution to the current Firefox 15 release was covered, the audience enjoyed it. Then followed a webmaking session by Rep of the month for September, Gautamraj Elango(Preferably called RAJ). His session saw an overwhelming response and many attendees ended up creating an awesome work with Webmaking tools like Thimble and Popcorn. It was time for lunch now, all the guests, Reps and volunteers enjoyed the mouth watering food from SICSR Canteen which had special arrangements for Mozilla Carnival. Post lunch Mozilla Rep and council member Vineel Reddy Pindy took the stage and introduced Firefox Flicks to the attendees. More people were still storming inside the auditorium for the event hence, more arrangements had to be made to accommodate them. Vineel played some award winning videos from the Firefox flicks competition. A Mozilla and web based Quiz was then organized for the attendees. It included answering 10 questions about Mozilla and the open Web. Diwanshi Pandey and Subhadra T. bagged the 1st prize for correctly answering 9 questions out of 10. Both of them were awarded exclusive Firefox flicks kits. With lots of claps and appreciation the winners were also awarded some exclusive Firefox flicks goodies. The Localization session then followed with Faisal Aziz nicely explaining methods for Urdu Localizations to the audience. Rep Rajesh Ranjan and Special Guest Aman Alam took over with Mozilla Localization methods using pootle and other tools. Student reps Priyanka Nag and Hema Bhanu, presented a nice talk on WoMoz explaining about importance of women participation in Mozilla. Parallel to this session Mozilla Rep (preferable called Debloper) talked about URL routing from the perspective of a developer and normal user. Audience enjoyed the knowledgeable session and the swags distributed. Soon much needed tea and snacks arrived. All used it to freshen-up their brains and minds. Next session was taken by Anwesh Mishra on about:config. This topic was presented in a new and an easy way to the audience by Anwesh. The audience appreciated his effort with a huge amount of claps. Swag like Firefox buttons, pens, Summer code party stickers, Mozilla stickers and many more were distributed among the attendees. At the end of the talks and sessions, Vineel’s session on how to contribute towards Mozilla and become a part of the awesome Mozilla Family saw many interested faces listening keenly. All the Mozilla Reps present at the event then introduced themselves and shared their interests. The event ended with a vote of Thanks by organizers Ankit Gadgil and Sayak Sarkar. Attendees enjoyed each and every moment of the carnival which was easy to make out as all of them were still fresh and happy even as the event ended late. Every attendee, Rep, special Guest and volunteer wrote their experiences and quotes on the Mozilla Carnival board of fame. Pictures were clicked with contented, happy and smiling faces. 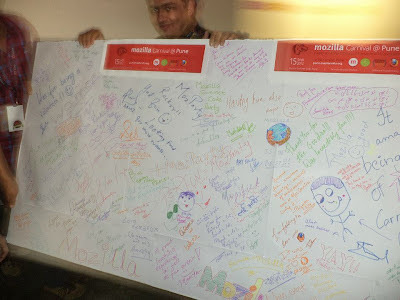 All the attendees, Reps, special Guests and volunteers signed the Mozilla Carnival Wall of Fame, wrote their experiences, quotes and suggestions. Kudos of “Mozilla-Mozilla- Mozilla” echoed all around the venue with the volunteers, attendees and reps celebrating the success of the event. The event wrapped up with happy faces all over and success of the event filled in the Air. A short video was also shot, featuring ReMos from India saying “Hello from Pune” to the Mozilla Community. All the Reps and Mozilla Volunteers moved for a well-deserved Dinner at Invitations Restaurant, Pune. With cutting a Mozilla Carnival Cake, success was celebrated. The event as a whole achieved a lot by signing in new members for contributions in localizations, Web makers and many more. The event saw a healthy audience of 150+ enjoying the webmaking experience, Mozilla was indeed able to create new smiling faces. Planning on more events in the near future, The Mozilla Pune Community and The Mozilla India Community will be active in organize such successful events, take Mozilla and its mission to the masses and contribute to open web. As organizers we (Ankit Gadgil & Sayak Sarkar) would personally like to thank Vineel Reddy Pindy, Soumya Deb, Faisal Aziz, SourabhShah, Ashish Namdev, Priyanka Nag, and Anwesh Mishra for their support at every step. A Big thanks to all the volunteers, SICSR College authorities and everyone who was directly or indirectly responsible for the success of the Mozilla Carnival, Pune. Cakeman is the best option if you are looking for Anniversary Cakes. We provide best Birthday Cakes, Rainbow Cake, Red Velvet Cake, Midnight Cake Delivery, Wedding Cakes, Custom Cakes in Amanora Town. Cakeman is the Best wedding cake shop in Koregaon Park, Koregaon Park Cake Delivery, Koregaon Park Midnight Cake Delivery,Online Cake Delivery in Koregaon Park.